Thompson Smith and Puxon (TSP) is pleased to be sponsoring the Rotary Club of Colchester Forum’s “Stronger Together” concert this Saturday evening (11th March 2017) at St Botolph’s Church from 7.30pm. 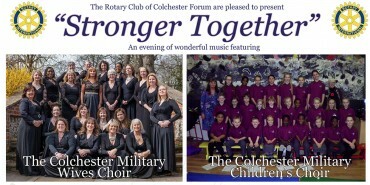 The concert brings together the Colchester Military Wives Choir and the Colchester Military Children’s Choir who will perform together in concert for the first time. The concert has been organised (and is directed) by Rotarian Ian Dewis and the Musical Director for both choirs, Sally Leung. The Colchester Military Wives Choir was established in 2012 and has since gone from strength to strength. They have performed in a number of high profile concerts including at the House of Commons, to mark Remembrance Day, and at the Dominion Theatre in London. The choir is part of a growing network of Military Wives Choirs across the forces community worldwide. The Colchester Military Children’s Choir was formed in January 2015 by Sally Leung for children at schools within the vicinity of the Merville Barracks. The choir have since performed in a variety of concerts but this will be the first time both choirs have performed together. Sharon Tidbury is the accompanist for both choirs. The proceeds from the concert will go towards this year’s Rotary charities, which are chosen each year by the President, in particular Colchester Samaritans and Colchester Age Concern. TSP Director, Richard Porter, is a longstanding member of the Rotary Club of Colchester Forum and regularly attends their weekly lunch meetings. You can find out more about the club, when and where they meet, and how to join here.